You may have seen my planter from Week 1 of the One Month To Win It challenge. But, I thought I’d show you how I made it, in case anyone wants one of their own (PS this is a SUPER cheap project). 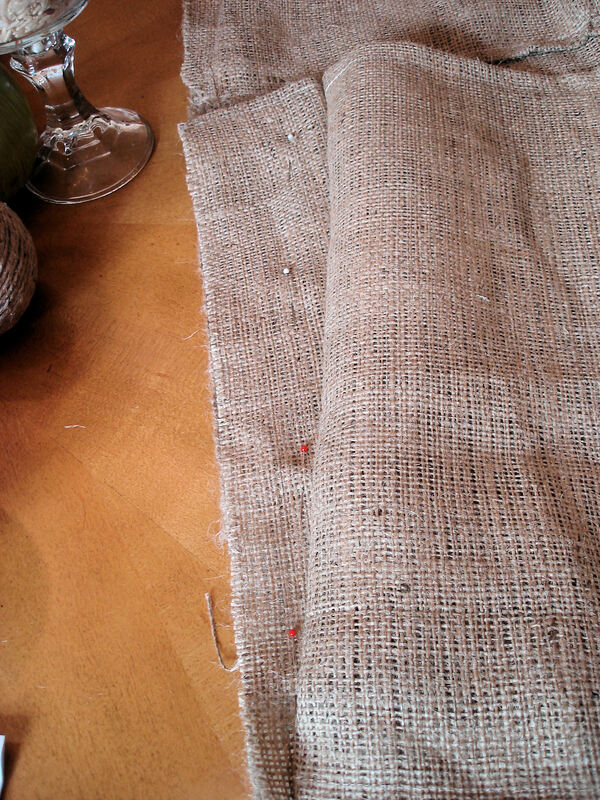 I used about 4 yards of burlap. I bought 6 and have a lot leftover. But ultimately it depends on how big you want to make your planter so you may have to adjust your measurements accordingly. 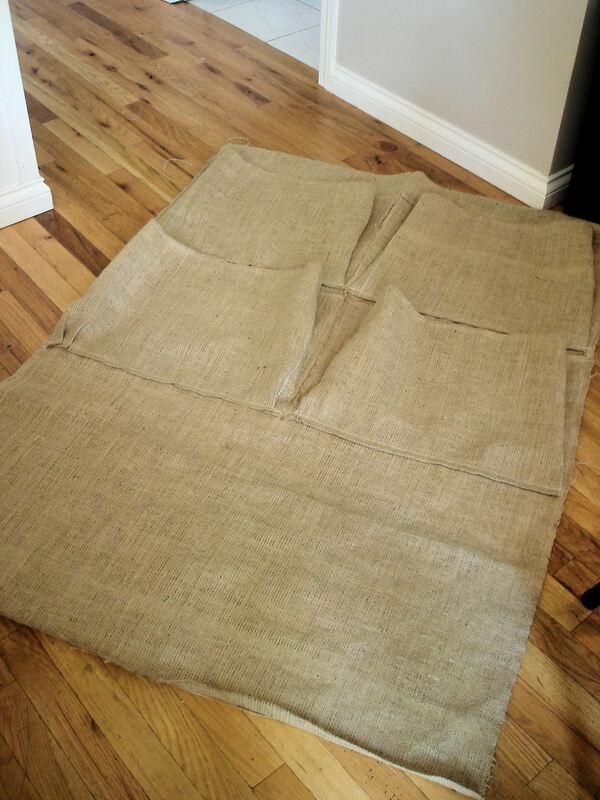 First, I cut a piece for the back, which was the full width of the fabric and about 56″ long. 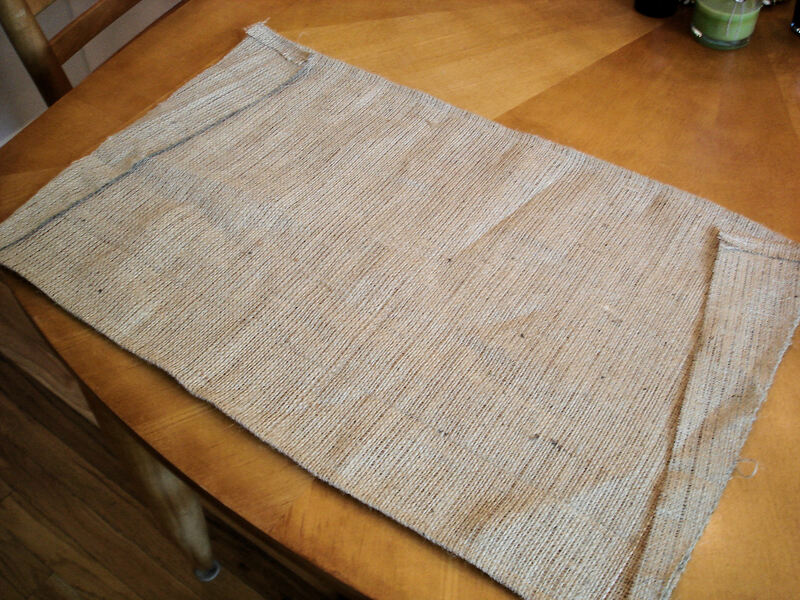 I hemmed the top and bottom (since the sides were pre-hemmed). I had seen commercial products say the pockets were 15″ high, so I cut out 6 pieces that were 17″ and half the width of the fabric. So basically, I cut a 17″ strip and then cut it in half. Then I hemmed the unfinished sides. I wanted the pockets to have some depth, so instead of sewing the sides directly onto to back panel, I added little triangle shaped pieces. Basically they were 4″ x17″ strips that I cut, then folded on the diagonal to crease. Remember, this is a classic Rachael project- meaning nothing is precise. Some of my triangles didn’t come out even….it really doesn’t matter. You’re not going to see the imperfections when you put the plants in it. See the crease? Cut along it as best you can and you end up with two long triangles. I only hemmed the short edge and arranged them on my pockets right sides together, with the angled edge (hypotenuse, for you geometry nerds out there) pinned to the edge of the pocket. 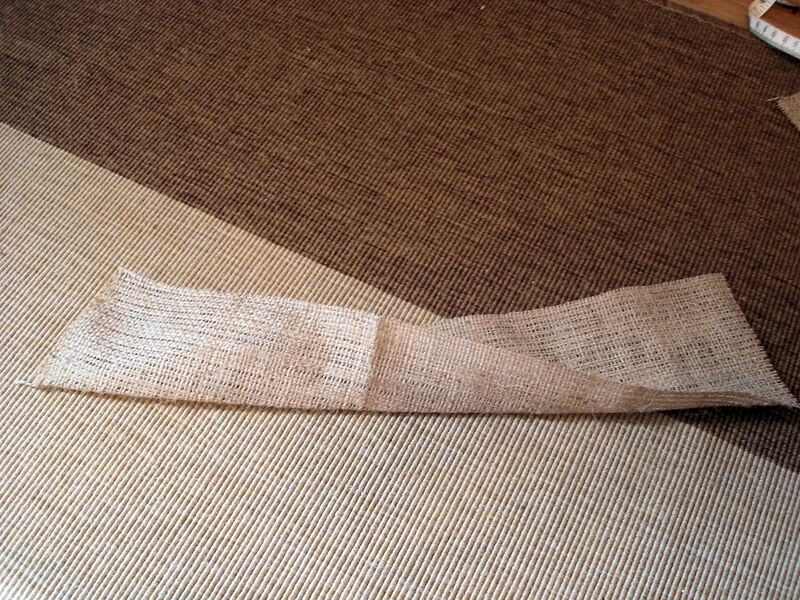 The straight edge is what will be sewn to the back panel. 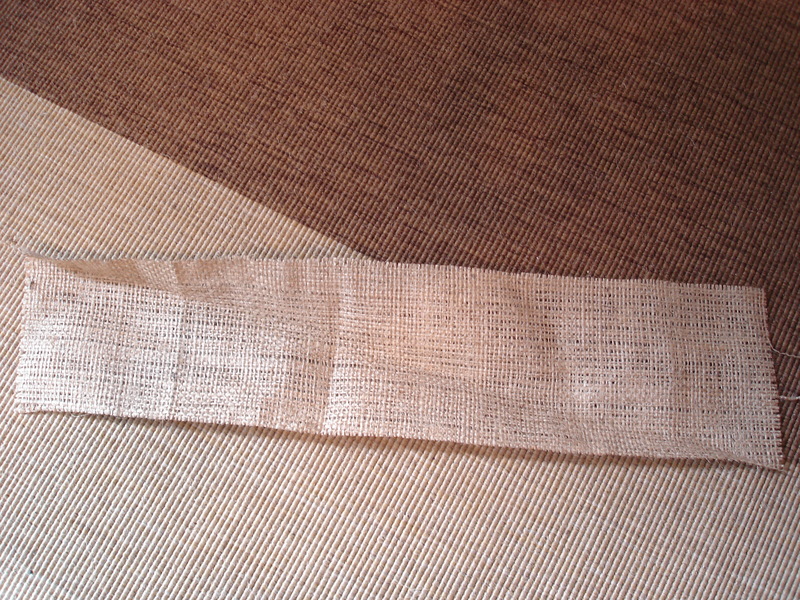 I sewed along the edge, and from this point on all my seams are double stitched. I wanted to make sure it could support the weight of the plants and soil. I repeated this process 6 times until I had all my pockets. Then I arranged one at a time on my back panel, edge to edge with a few inches left at the top and bottom for finishing and hanging hardware. I didn’t do “right sides together” because it would be really difficult to get to the insides of the pockets. I sewed the two sides and the bottom of each pocket to the back panel. Again, these are double stitched seams. Notice how the pockets gap a bit because I’m making sure each one only takes up half the width. Since we added those triangle sides, you may have to squeeze the fabric in place with some pleats to get it all in. Keep going until you have all 6 pockets done! Now here’s the part where I stop taking pictures because I was making stuff up as I went, and I wasn’t sure what would end up working. When I thought about hanging it, a few methods came to mind including large eyelets and D-rings. Ultimately I decided on the D-rings. To attach them, I cut (4) 2″ x 12″ strips. I triple stitched 2 together on all four sides twice (did that even make sense?) to make 2 heavy duty straps. I threaded the D-ring on them, then pinned them to my planter. Here’s where it get’s tricky. I happened to choose the center-ish area of each side of pockets, but depending on where you choose to attach them, you may or may not have to do this next step. I was super annoyed at myself for not thinking about this possibility, but hey I was making this thing up from scratch! If I can do anything well-and this was born out of necessity- I can fix mistakes. This is a skill you build when you attack projects with reckless abandon. Instead of moving the straps (they were triple stitched on there- plus I wasn’t entirely sure that proper placement would solve my issue), I decided to add a brace on the back of the panel. In some magical stroke of genius, I thought “Hey, I’ll just use two of those garden stakes leftover from my patio project and make a pocket to shove them in.” I think the pocket is about 3-4″ long and the full width of the back panel. Both sides are open. Two garden stakes were just a bit too long to fit end to end without sticking out so I just shoved them in from either side and they overlap in the middle. Or if you’re not lazy, you could cut them. If you’re especially not lazy, you could do one at the top and one at the bottom. It worked! So without further ado (and in conclusion to the wordiest and most ridiculous tutorial ever), here are some finished shots. My long term plan is to hang it on the side of our house with my trellises, but for now it’s hanging out on the front porch. It would look better hanging on a wall since the idea is to create a space something like this. For now, I’m keeping it simple (you know how I am with plants.) I take the plants out to water them, which is a great benefit to leaving them in pots! 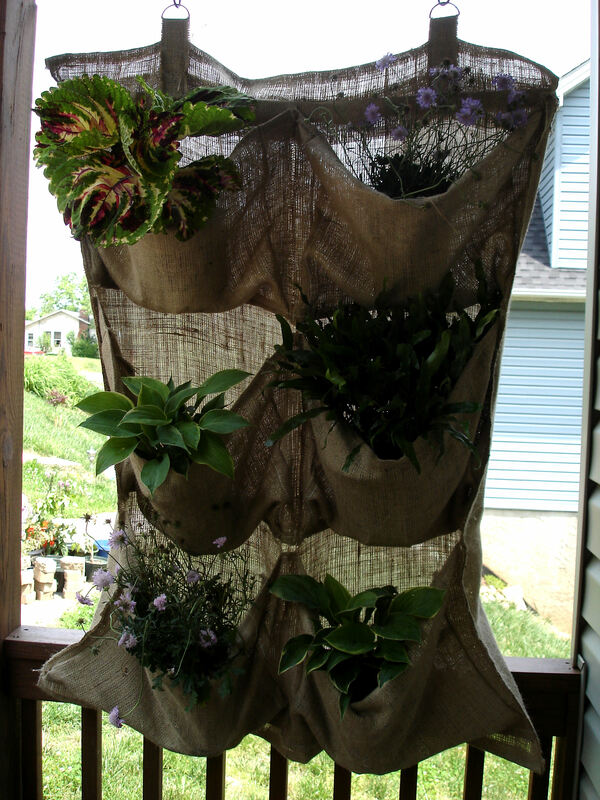 I think I made this for less than $15 in materials (considering I had burlap leftover). Pretty sweet since the real deal can cost upwards of $40/pocket! 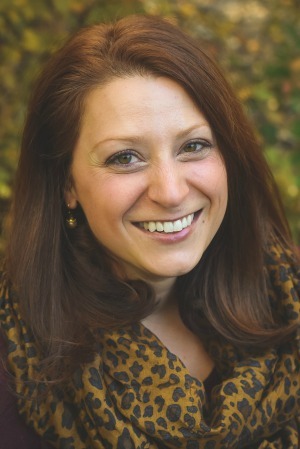 Guest Blogger: Amanda from The Ivy Cottage! LOVE this idea!!! And you got my vote friend!!! 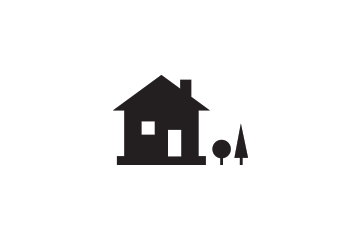 I may or may not have recognized your porch in your picture at the contest… heehee. What a unique and crafty idea! 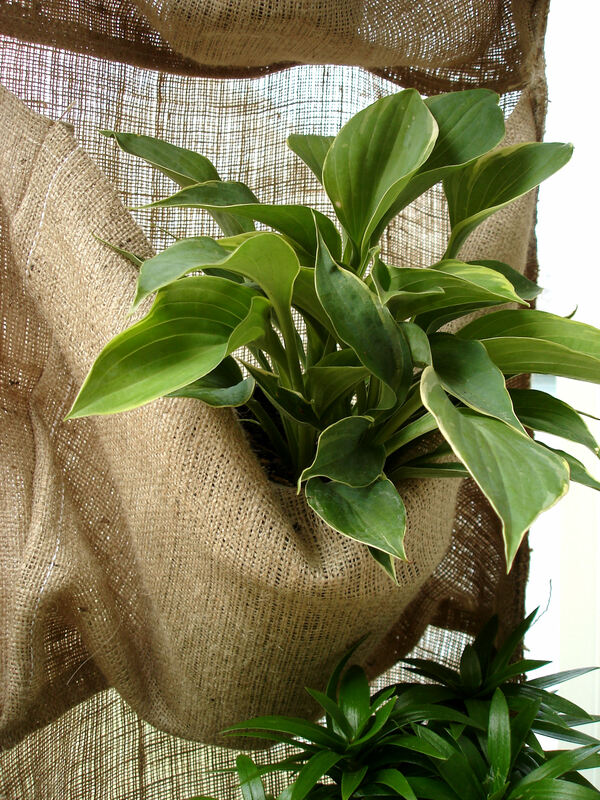 What a clever use for burlap! I just love this idea!! I hope you will link up at my party! This is so cool! 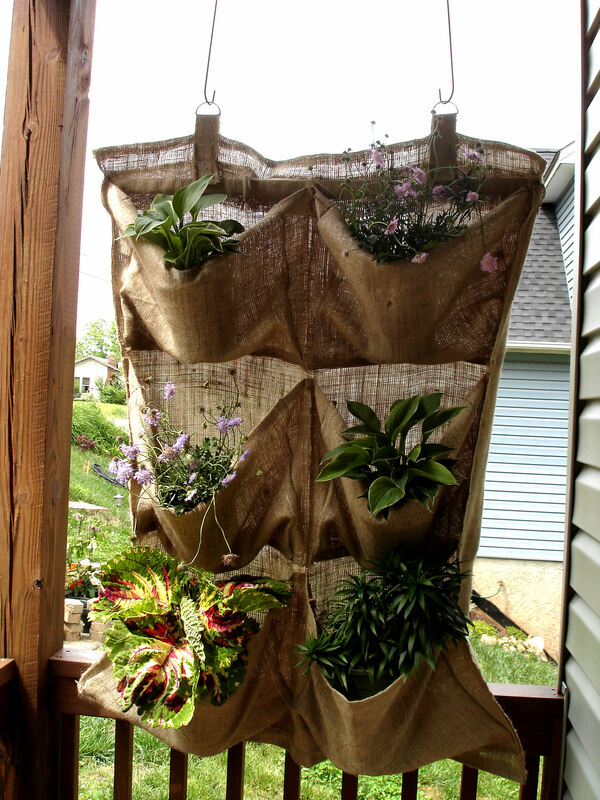 I bet it will look great on your trellises.